Guernsey and the other Channel Islands lived for hundreds of years right on the front line of conflict between Britain and France. Islanders had to train and be ready to fight to defend their homes at a moments notice. To do this a Guernsey Militia was formed. In Part II of this article we track it’s illustrious history from post revolutionary France in the late 18th Century up to the end of the Militia in the mid-20th Century. Part I of the Guernsey Militia Story is available here >>>. General Order, Headquarters. 13th February 1794. The arms that are in repair with the Master-Armourer will be given out to the different Regiments of Militia in equal numbers to each Regiment, conforming to the number deficient in the Regiments. The arms that are at Castle Cornet, which are to be delivered by Mr Barclay at the Long Store will be brought over to the Long Store tomorrow, with cartouche-boxes and ammunition, a good flint in each firelock, and a spare one with the ammunition; the swords to the sailors will be brought over also. It is expected that every person who is able to act in any line, will exert himself to the utmost to prevent the enemy from making good landing in in Guernsey, or die in the attempt there being no choice when so situated with such inhuman enemies and everything that can be dear to us at stake. It is expected that all persons who have arms in their own possession will bring them with them at any alarm to prevent any deficiency. By 1800 the Militia is recorded as numbering 3,158 all ranks plus 450 boys. Once again, an invasion by the French was the main threat to the Channel Islands and all the efforts undertaken by the Guernsey Militia to fortify the Island was to resist just such an attack. During 1804 the Militia North, South and West Infantry Regiments were re-styled as Light Infantry and underwent the new training for Light troops. The constant threat of an invasion by the French forced the Militia to constantly be on a state of alert and meant they were regularly called out when an attack was feared. Pressure increased when the English regiments that were normally garrisoned on the Island for its protection were called away to fight in Europe. In 1814 news reached Guernsey that the allies had entered Paris and that the Napoleonic War was almost over. This led to much celebration in the Island. The jubilation was short-lived, however, as Napoleon escaped from exile in Elba and raised another Grand Armee. It was not until his defeat in June 1815 at the Battle of Waterloo that the Island and the Militia were finally able to breathe a sigh of relief. During the first quarter of the 19th Century a Militia Royal Marine Corps was formed. It probably operated under the Revenue Officer, enforcing inspections of shipping arriving in the Island, providing guards or patrols around the harbour and handling maritime security matters. In addition, a Company of Pioneers was formed attached to the Militia 2nd (North) Light Infantry Regiment. 1824 The manning of the Island’s coastal guns was reorganised. The Militia Battery men were replaced by men from the new 2nd Battalion of Militia Artillery. In the forts and batteries the distinctive scarlet infantry uniforms gave way to the blue of artillery. 1st Qtr The exact date is unsure, but at some time during the first quarter of the 19th Century the companies in each Militia regiment who had been armed with Baker rifles in 1802 were clothed and equipped as rifle companies. The men henceforth wore green uniforms. 1833 Men of the 2nd Battalion of the Royal Guernsey Militia Artillery manned the guns in the forts and batteries around the Island until December 1833. In this month the battalion was disbanded. Manning of the ordnance in the batteries and forts returned to the Royal Guernsey Militia Infantry regiments. 1833 Between 1833 and 1834 the 1st (East or Town) Royal Guernsey Militia Regiment was converted to Light infantry. 1835 The Royal Guernsey Cavalry & Light Dragoons were disbanded. 1853 The Royal Guernsey Militia Field Artillery Regiment retired their 6 pdr guns. They were replaced by twelve 9 pdrs and four 24 pdr howitzers. 1854 (June) The Royal Guernsey Militia Light Infantry companies had their flintlock muskets replaced with new smooth bore percussion muskets. 1859 The Militia infantry was issued with new muzzle loading Enfield rifles. These remained in service until 1870 when breech-loading Snider-Enfield rifles were issued. It was also at this time that the Rifle Companies were finally abolished. 1882 In 1882, Arsenals were built for the 2nd and 3rd Regiments at le Bordage (Baubigny), St. George (lies Beaucamps), Les Naftiaux and St. Peter-in-the-Wood (Les Islets). These were all known as ‘out-arsenals’. The headquarters still remained the Town Arsenal which was handed over to the Guernsey Artillery and 1st Infantry Regiments. Each Arsenal had quarters for the Permanent Staff, a spacious Drill Hall and Clothing Store, etc. The Headquarters Arsenal also has Gun-sheds, Officer’s Stables, Armourer’s shops and Practice-rooms for the Bands. In 1902 they were issued with drab khaki service dress in line with English Regiments. This replaced the distinctive crimson tunics used by the infantry and blue tunics used by the artillery. These were, however, kept for ceremonial and parade use. English Regiments of the Line continued to provide a garrison on the Island. The Royal Guernsey Militia Regiments continued to train hard and provide what, in modern terms, was a Territorial force. At the beginning of World War One the English garrison was withdrawn from the Island in order to form part of the British Expeditionary Force to Europe. As it had done on many occasions during the 19th Century, the Royal Guernsey Militia was mobilised lo take over the role of the garrison and provide security for the Island. Militiamen could not be sent overseas but the States decided to offer a contingent of trained men to the British Government. Two full strength infantry companies and a machine gun company were sent to join the 16th (Irish) Division of the British Army. A Divisional Ammunition Column was formed from the Royal Guernsey Militia Artillery and sent to the 9th (Scottish) Division. 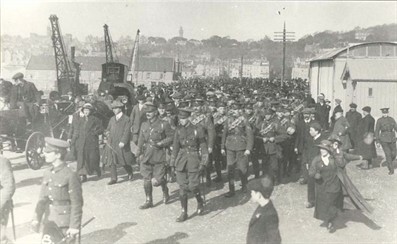 Many individual Guernseymen answered the call for men to join the British Army and went to England to enlist. Under pressure from the Lieutenant Governor, Sir Reginald Hart, the States of Guernsey agreed to raise a full infantry battalion for the British army. As a result, at the end of 1916. the Royal Guernsey Militia was suspended and the Royal Guernsey Light Infantry was raised as part of the British army. Most of the initial officers and men were former members of the Militia. The R.G.L.I. served with distinction in the War winning many awards. However when the Regiment returned to Guernsey in May 1919, hardly any family in Guernsey was left untouched. The R.G.L.I. left behind them 327 graves in France. The war had been won, but at a terrible cost which was felt in every home in the Island. After World War One the Royal Guernsey Light Infantry once again became a Militia force and attempted to return to its’ former life. The Great War had killed and injured many men and the force was seriously depleted. It took many years for the Royal Guernsey Militia and the Island as a whole to recover. English Regiments again returned to the Island and the Militia continued to provide support for the garrison. Throughout the following years the militia regiments trained and exercised and continued to provide a strong presence. This was felt particularly on public occasions when they would undertake parades, provide guards of honour and stage demonstrations of their skills. The Militia’s military band was a regular, much welcomed and much anticipated sight around the Island. Militiamen also competed in shooting and artillery competitions both on the Island and in the UK. At the start of World War Two in September 1939 the States of Guernsey was again faced with the decision of whether to furnish a dedicated Guernsey battalion for the British Army The lessons of World War One had been learned and it was felt unwise to do so Pals’ battalions or military units comprising men of one particular geographical area were no longer favoured Losses made by such a battalion would impact heavily on single communities. It was thought far better for men from one community to join different regiments so that the risk was spread more evenly. With this in mind the States disbanded the Royal Guernsey Militia permanently. As they had done in the First World War the men of Guernsey then took it upon themselves to answer the call to arms. Hundreds joined the British armed forces in order to fight the Nazi threat. Men with Militia training took their knowledge and experience with them. Another key factor in the States’ decision to dissolve the Militia was the knowledge that the Island could be invaded by the Germans. As this became a certainty, demilitarisation was put into motion. As part of this process the written records of the 20th Century Guernsey Militia were either hidden or destroyed It is believed this was done so that that the identities of Militiamen and ex-soldiers could be kept a secret from the Germans. The bulk of these records has not surfaced to this day. Our knowledge of the Royal Guernsey Militia during the 20th Century is based on surviving artefacts fragmentary documents the photographs which survived in private homes during the Occupation. The large collection of Militia silverware, key pieces of which are on display in this Guernsey Museum, was hidden just before the German invasion. Thankfully it was not discovered during the five long years of enemy occupation. Fortunately this valuable part of the history of the Royal Guernsey Militia survives to this day.